Thanks for an interesting look back into the folk music era...I miss some of the music from those days. sold 50 new cars; it takes a while to catch on. Thanks for the compliments and tip re: Heidi Neprud. Who knows? Maybe Joy will find the Web site and contact people. That sort of thing is the object of the exercise. i haven't seen joy neff for 32 years! in real estate, but that was years ago! and a classmate of mine at L.A.C.C. You've done a fantastic job here. Not only in getting your facts right but in keeping with the sprit and the tone of the times that made the Garret what it was. No annoying glaring colors or dancing cartoon charactors. Well, this is disappointing. Doesn't anyone have anything to say? After all this work? 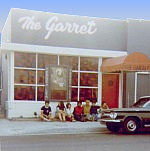 bring the garret back to life. About Bloody Time! like to chat about those times? Best Wishes and Love to all of you 'Garret-Folk' ! Congratulations on getting this working! It's a really nice little site. 10th October 2001 -- 9:43 p.m.
Hi folks! You may now feel free to talk among yourselves. Enjoy!